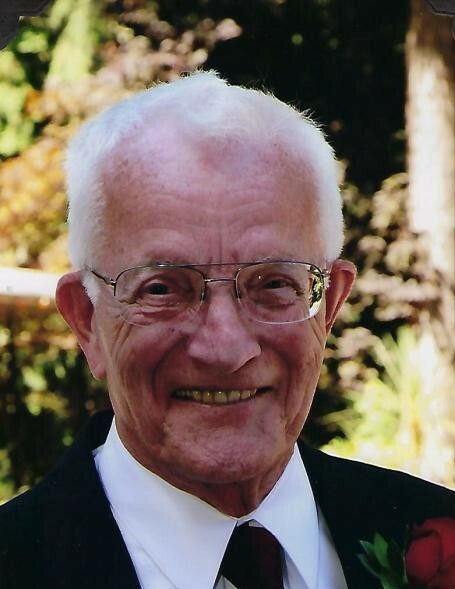 Joseph T. O’Shea, a longtime resident of Kent, Washington passed away peacefully on Wednesday, March, 20, 2019 with family by his side. Joe was born October 10, 1921 in Salina, Kansas, to James G. and Sarah A. O’Shea. He explored many musical avenues as he grew up, including the violin and clarinet. He was in a small country band when he was in his teen years, and sang at church. Dad lived through the depression and at times, survived on popcorn and tea. He graduated from Sacred Heart High School in 1939. Joe enlisted in the US Navy in 1940 and was a Pearl Harbor Survivor. He spoke at many local schools explaining history with the next generations. He served in the US Navy for 6 years, and had many stories to share. After WWII, he earned a Bachelor’s Degree from Kansas Wesleyan and also attended Georgetown University in Washington DC. He was President of his fraternity. In January 1954 he married Margaret McCarron, and they made a beautiful life together. He was a carpenter, lumberyard manager in Pateros, WA, and a finance legend at Boeing. He was a member of Full Gospel Business Men of America, worked with the God mobile at The Washington State Fair, sang barbershop in competitions, played guitar, wrote poetry, Prayer group leader, Prison ministry in Monroe, PTA Vice president at Park Orchard, as well as a true friend, neighbor and man dedicated to his family. Joe will be remembered for his positive attitude in life, his caring love, his musical talents, his engaging personality and his dedication and love of the Lord. He also loved to travel, and after mom passed away, he spent many adventures with his brother, Mike, going places in the United States, Canada, Mexico and Ireland. It seemed like they would start planning the next trip the week after they came back home! He is survived by his son, daughter, three granddaughters and seven great-grandchildren. His life was full and we adored him. A memorial service will be held Tuesday, April 2 at 12 pm at Edline –Yahn Funeral Chapel in Covington, Washington, reception to follow. Military service and internment at Tahoma National Cemetery in Covington, Washington, will follow at 3 pm.